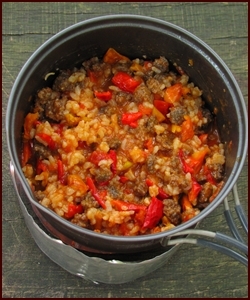 Follow Chef Glenn's backpacking recipes to create healthy, hearty, homemade meals for the trail. 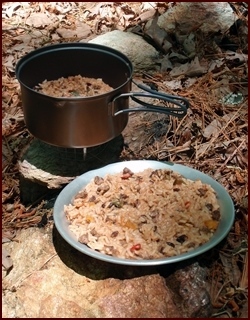 These dehydrated meals pack up light and tight and are easy to cook at your campsite using minimal fuel. Cook a big pot of chili or stew, dehydrate and divide into individual servings. Dehydrate vegetables, meat and beans separately and assemble into meals. Enhance store-bought boxed meals with additional dried meat and vegetables. 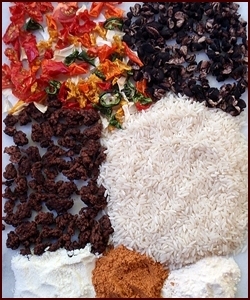 Create saucy backpacking meals by blending and dehydrating starchy foods like potatoes and beans into bark. Dehydrate tomato sauce for Italian style meals. 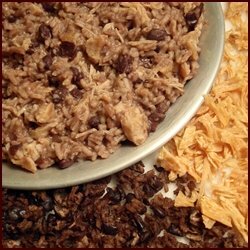 All of the backpacking recipes linked below are for a single serving. Increase the ingredients proportionally by 1.5 or 2 times if you have a large appetite or you are cooking for two in the same pot. Bon Appétit! Cook a big batch, dehydrate, and divide into meal size portions. Heat and eat for supper or munch out of the bag while hiking. This meal features yams, parsnips, turnips, and rutabaga with Moroccan spices and packs carbohydrates for energy. This French summer vegetable stew combines eggplant, zucchini, peppers, onions, and tomatoes with garlic and herbs. Dehydrate meats and vegetables separately and combine with rice, noodles, or potatoes. Back to Nature® or Annie’s® Macaroni and Cheese with added meats and vegetables. Ham and Cheese, Kickin' Veggie and Taco Mac 'n Cheese. Tuna with macaroni, tomatoes, onions, mushrooms, and peppers in a white cheddar cheese sauce. Crab meat, a creamed sweet corn base, and celery, onions, tomatoes, and bell peppers. Shrimp, grits, bell peppers, and onions. Beef, beans, peppers, onions, tomatoes, and rice in a zesty cheddar cheese sauce with taco seasoning. Muy delisioso! Dried pineapple and coconut add a touch of tropical sweetness to this backpacking meal. Curry and chili powders combined with powdered milk give this backpacking recipe a Thai flavor. Divide the box contents into smaller portions and combine with dehydrated vegetables and meat. Many packaged noodle, rice, and potato products commonly found in grocery stores achieve their flavor and consistency with partially hydrogenated oils, MSG, and excessive salt. Chef Glenn recommends that you read the labels and choose healthier products such as those pictured above for your backpacking recipes. Give your backpacking meals an Italian flair with tomato sauce. Learn how to make Tomato Sauce Leather. Recipes: Unstuffed Peppers and Seafood Raminara. 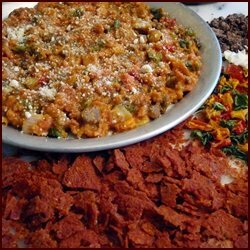 Blend and dehydrate starchy vegetables into bark and use it to make flavorful, saucy backpacking meals such as Mashed Potatoes with Meat and Vegetables, Sweet Potatoes, Bean Bark Stew, Corn Bark Stew, and Pasta Bark Marinara. 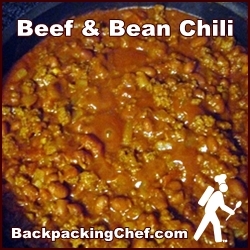 Explore over 50 recipes shared by readers of BackpackingChef.com. If you have a good one, there's a form for you to share it. Jamaican Jerk Chicken shared by Squidbilly's Wife shown at right. 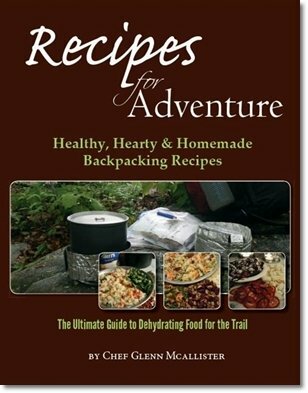 Find all of Chef Glenn's backpacking recipes, including several not included on the website, nicely formatted in Recipes for Adventure. The recipes include an additional serving size which is 50% larger for big appetites. The calories are listed for each recipe. Most of the recipes have interchangeable ingredients so you can easily add tremendous variety to your backpacking menu by substituting chicken for beef, broccoli for mixed vegetables, etc. Click the book cover at left for details.